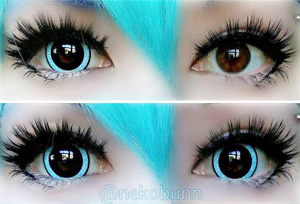 Lovely turquoise contact lenses with a striking big diameter will prove useful on manga and anime conventions. Quality quarterly contact lenses. You can wear ColourVue mini sclera Nebulos contact lenses in various occasions. You might want to use them only with special costumes and make use of their enlarged size and bright color. You can also wear them on a daily basis if you're into kawaii culture and you like to look like a sweet, innocent girl from a Japanese manga or anime. With ColourVue Nebulos contacts you can be sure that your expectations will be met as these 17mm contacts not only optically enlarge your eyes but they also give them an amazing aqua color, which create a striking effect on the eyes. They will look even better with a bit of make up, just to contrast their beautiful coloring. These lenses are only available in zero power.